As a finance student at St. 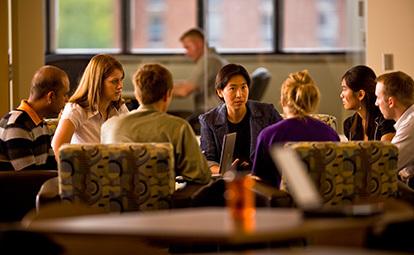 Cloud State, you'll learn the important role finance plays for business, industry, government and nonprofit groups in connecting the present to their future. Students in the program become experts in securities, management, investment, international business, government regulation, administration and service agencies. They learn how to help clients analyze their growth, invest its capital in securities and stocks to build the financial resources needed to grow, modernize and develop new markets or services. The latest tools and technology are available to students in the recently remodeled Herberger building on campus. Twelve-week, senior-year internships let students apply what they've learned in the classroom, earn academic credit and pay. Students build a resume with real work experience in an entry level job in their field. Students develop leadership and decision-making skills as members of active student clubs and organizations that encourage professional, personal and social growth. Notable alumni: Brian Belski '88, chief investment strategist at BMO Capital Markets, a multinational financial services company. Husky Growth Fund Class: Created in 1999, the Husky Growth Fund is a student-run portfolio management class that currently oversees (approximately) $190,000 of invested assets. All investment decisions are made by undergraduate students.